Before starting on this post I did a quick search for "gilding adhesive" and was shocked by the wealth of misinformation available. This is a good case for why it is important to know and trust your sources to make sure you are getting quality information. No, using your fingers to apply gold leaf on a layer of Elmer's glue is not the best practice. Nor is using your fingers to smooth wrinkles in the applied leafing. Wow. Just. Wow. If you too do a similar search you'll find that there are many choices available to you and a plethora of questionable processes. This is by no means an exhaustive list of adhesives but it's generally what you need to know for decorative art applications. Traditional types of adhesive include those mixed from shellac flakes and denatured alcohol. This type dries very hard and can also be used as a top coat. Traditional water gilding (not water-based adhesive size) is a complicated process that takes years to perfect and is often used for restoration work. Oil-based adhesive size is available in quick dry, or slow set variations. You choose the type depending on how much open time is required to complete your project. I typically do not use oil-based size but have needed it a time or two when the underlying base was incompatible with water-based size. I use water-based adhesive that is specially formulated to be thick so that I can use it with stencils but this also makes it particularly useful for other applications as well. Let's start with a standard application. The adhesive that I use can be diluted with water at a 6:4, adhesive to water ratio, which results in a brush-able adhesive that goes on smoothly yet remains strong enough to prevent breaks in leaf coverage. Some regular (thin) gilding adhesives are weak and require extra coats for full adhesion. 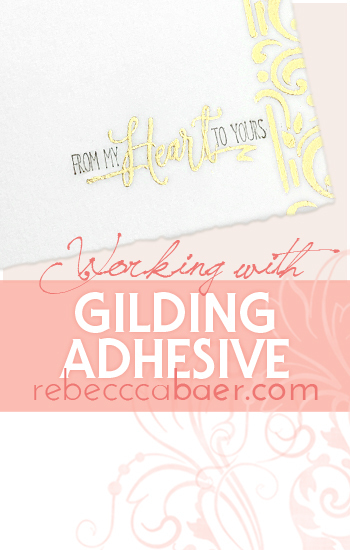 By starting with my thick version, Rebecca Baer® Gilded Stenciling Adhesive, I can control the level of tackiness desired including further dilution to create a low tack version. This could be useful if I want to create a sporadic, broken application to enhance a vintage appearance. Once the adhesive has been applied it must dry before proceeding. You can tell when it is ready because it will turn clear. If there is any milky haze then it is not quite dry. Wait for it or you will suffer life long regrets. It is better to allow a little more time than rush in too soon. Another advantage of my thick adhesive is that is can be used effectively on both non-porous and porous surfaces, such as paper or cardstock, on which thin adhesive is just absorbed. It securely bonds and does not cause paper to buckle. This makes it the ideal adhesive for embellishing watercolor paintings. In addition to gilding paper it can be used to dry mount paper using the process described in this video. This method is useful for adding decorative paper to a surface or mounting art papers, i.e., watercolor, charcoal or pastel paper, that would be altered by other methods, to a firm backing. Find more inspirations for this application here. This adhesive can also be used to dry mount fabric using a similar, but not identical, process. This brings us to the original purpose for which this particular adhesive was developed, to use with stencils to create detailed, gilded designs. As a stencil designer and manufacturer who also loves creating gilded accents I tried using regular adhesive with my stencils. The problems were two-fold. First, if I wiped excess adhesive from the brush, like you would with paint, to prevent bleed the result was that the adhesive applied was too weak to make the leaf bond. If I used a bit more, then the adhesive would bleed under my stencil, creating a horrendous, sticky mess. I worked with an adhesive manufacturer to develop this thicker version that works like a charm, like the gilded, stenciled border shown above. To use it pick up a small amount on your brush and wipe well to remove excess. Pounce over the stencil to cover the motif. You should just see a change in sheen. If you see white then you are using too much and risk bleed. Remove the stencil prior to applying leaf. Go ahead and wash it while you give the adhesive time to fully dry; the adhesive is more readily removed when fresh. Warm water can soften fresh adhesive enough to roll off with your fingers. For stubborn residue use 91% isopropyl (rubbing) alcohol. As an added bonus, you can also use it with rubber stamps, like the word "Heart", shown above. To do this, use a sponge wedge to tap out the adhesive on your palette so that it is a thin, even layer. Use this to gently tap over the stamp image. Do no press or the adhesive will collect in the recesses. Stamp the image and wash the stamp immediately in warm water. Use a brush to clean the crevices. Once the adhesive is dry apply leafing. This is a quick and easy finish for the back side of an ornament. This post focuses on adhesive rather than the full process of gilding but I wanted to explain why using your fingers as described above is not a good practice. When you handle leafing you deposit oils from your hands onto the sheets. This creates visibly discolored (tarnished) areas on the leafing. Never handle leafing directly with your bare hands although, in my case Baer hands (as long as they are protected) are just fine.